Alas, Drone Rules! Be Careful What You Wish For? Under Title 14 of the Code of Federal Regulations, the FAA is proposing to amend its regulations to adopt specific rules to allow the operation of small unmanned aircraft systems in the National Airspace System. These changes would address the operation of unmanned aircraft systems, certification of their operators, registration, and display of registration markings. The proposed rule would also find that airworthiness certification is not required for small unmanned aircraft system operations that would be subject to this proposed rule. Lastly, the proposed rule would prohibit model aircraft from endangering the safety of the National Airspace System. The proposed rule is now open to public comment, with a final set of rules expected in 2017. 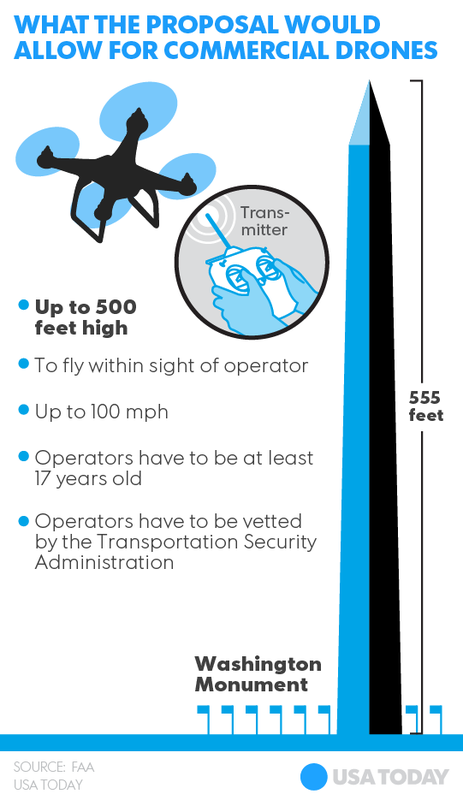 The person actually flying a small UAS would be an “operator.” An operator would have to be at least 17 years old, pass an aeronautical knowledge test and obtain an FAA UAS operator certificate. To maintain certification, the operator would have to pass the FAA knowledge tests every 24 months. A small UAS operator would not need any further private pilot certifications (i.e., a private pilot license or medical rating). A small UAS operator must always see and avoid manned aircraft. If there is a risk of collision, the UAS operator must be the first to maneuver away. The operator must discontinue the flight when continuing would pose a hazard to other aircraft, people or property. A small UAS operator must assess weather conditions, airspace restrictions and the location of people to lessen risks if he or she loses control of the UAS. A small UAS may not fly over people, except those directly involved with the flight. Flights should be limited to 500 feet altitude and no faster than 100 mph. Operators must stay out of airport flight paths and restricted airspace areas, and obey any FAA Temporary Flight Restrictions (TFRs). Initial industry reactions are largely positive, and the age and qualifications of drone pilots is particularly promising for companies looking to avoid the costs of hiring an FAA licensed pilot. From an administrative perspective, the FAA has potentially eased its workload by getting its homework done and proposing these rules. The processing of special exemptions, 333 petitions, certificates of airworthiness or waivers will eventually give way to a definite regulatory regime in which the well-known “careless and reckless” standard will apply uniformly to operators of unmanned aerial operators — creating a more manageable administrative burden than the current ad hoc approach to commercial UAV flight. In addition, the policy and economic impact of these proposed rules is self-evident: The law gradually will, as it should in this context, cede to marketplace forces, catalyzing the smart and organized and safe commercial drone companies to the front of a brand new space in the global economy. Beware: the practice of chiding aviation regulators (even diplomatically) for an apparent lethargy in promulgating UAV rules is at an end and the time is at hand for existing and developing commercial drone companies to distinguish themselves on deliverables. In this respect, while there is lots of discussion about how many companies (more than 7,000) are poised for take off when a final set of rules issues, it can be expected that the industry will contract into a few leaders as is true in other industries with low entry costs and firms with overlapping capabilities. Those UAV companies with strong fundamentals will survive in what will almost assuredly be a Darwinistic marketplace. Business wanted the law out of the way – game on and Godspeed. Posted in UAV and tagged Aircraft, Airspace, anti-drone law, Aviation, civil drones, department of transportation, drone, drone law, FAA Federal Aviation Administration, UAS, UAV, UAVs on February 17, 2015 by Timothy M. Ravich.